Less than a year after the excellent Dishonored 2 (which you can read our review on our site), Arkane Studios decided to expand on the franchise with a standalone chapter called Death of the Outsider. This time, Corvo and Emily leave the spotlight for Billy Lurk, which was introduced in the Dishonored 2, an ex-associate of Daud, the assassin from the blade of Dunwall DLC back in the original Dishonored. If the recipe for the game is always the same, is there enough new features and content to be tempted by this experience? Even after finishing the main Dishonored 2 adventure, players continued to wonder Billy Lurk. Who is she really? What were her motives to help us? So many questions that Dishonored: Death of the Outsiders will answer. Playing as Billy, we learn so much more of the Dishonored lore, like what became of Daud, understanding how and why Billy is a woman so tortured and enigmatic but especially, what are the origins of the Outsider, a central character in the saga. The good part is that this standalone can be played both by newcomers as well as those who have completed the previous games. The script, which is really interesting, is sufficiently detached from the previous games, while still managing to link to the original lore for those that are fans. On the game mechanics side, Dishonored: Death of the Outsiders slightly revisits the basic formula to instill a welcome renewal. The runes, which helped to improve powers or unblock others, don’t exist, limiting you to only three spells. The first is a classic to the franchise, will allow you to teleport quickly to a spot, like the Blink. The only noticeable difference with the previous versions – other than its name Displace – is that this time you will have the opportunity to see a “clone” that will tell you where you will land. The clone can also help you tactically by distracting the people around you. The second skill – Semblance – is much more innovative, and will help you gain the appearance of enemies and civilians in order to blend more easily into the area. This skill can seriously deepen your way to evolve in levels and greatly increases the different approaches that we could have to reach our objectives. Finally, the last power aims to replace the “beating heart” from the previous opus. Foresight gives you the opportunity to get out of your body to wander around the area. This is a great way to scan around for enemy presence, as well as your search for hidden bone charms. The later are indeed at the heart of the game and play an important part in the customization of Billy’s characteristics and the way to approach the title which is more centered on action than stealth. For this episode, players returns to Karnaca in an area we had not explored in previous games. I soon realize the talent of the teams at Arkane Studios to build quality levels that offer many possibilities to the players. In total, there are six main missions waiting for the player to complete in Death of the Outsider, all with their own inspired level design. This time though, there’s even more added value in the game, thanks to captivating the secondary objectives in each missions. In terms of lifespan, count between eight to twelve hours to complete the game, unless you just want to stick to the main path which can be done in less than 5. On the technical point of view, Dishonored: Death of the Outsiders seemed to be finer than Dishonored 2, with an artistic direction always as sublime and original. The Void Engine is still running great on consoles even with some rare framerate drops, but it is mainly the diversity of monuments and how the mood of the game is transcribed with the colors and lighting effects that makes the charm of Dishonored. As for the characters, from Billy through Daud or the Outsider, they benefit from a clever and intelligent design, all with their own striking and charismatic traits, something that is rare enough in the videogame industry nowadays. I will note that the loading times are a bit long, which is annoying especially if you are attempting to find the perfect way to finish a mission, or using some trial and error strategies to finish key parts in a mission. 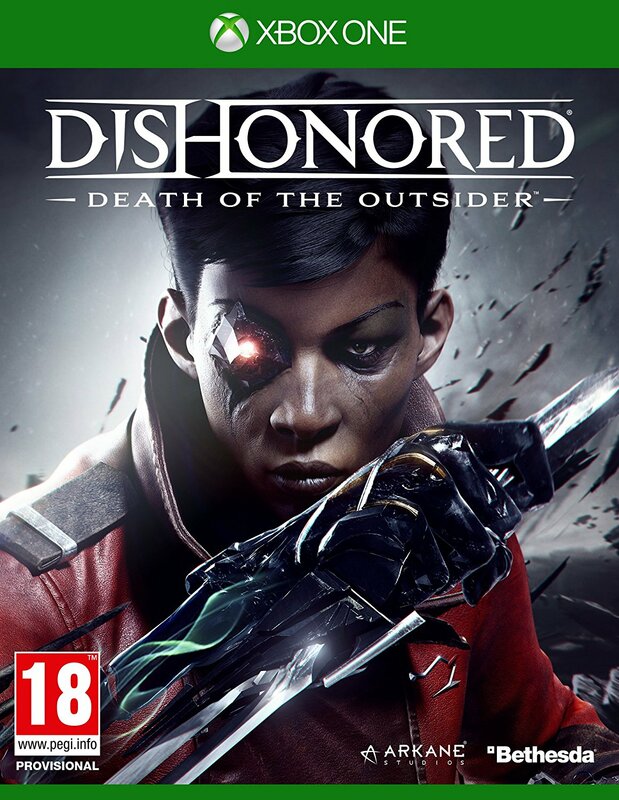 Without changing the foundations of the franchise, Dishonored: Death of the Outsiders plunges us successfully into a thrilling adventure. Arkane Studios' newest chapter is more about the action than the stealth infiltration formula this time, which can get some people out of their comfort zones, but once used ot it, will enjoy the deadly possibilities of killing your enemies.